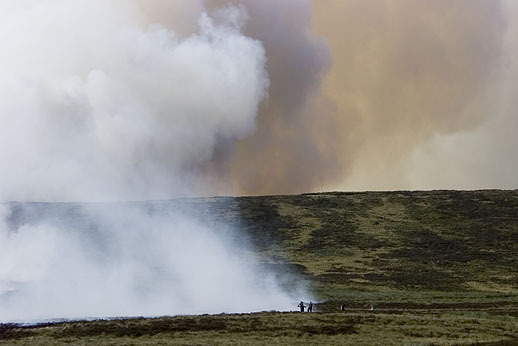 Moor fires continue to blaze as the hot, dry spell leaves much of the high ground of northern England tinder dry. The latest outbreak was on the Yorkshire-Lancashire border, between Oakworth and Laneshawbridge, where firefighters from Lancashire and West Yorkshire were this afternoon tackling the blaze. A large area of Dove Stones Moor and Combe Hill caught fire around 2pm today. Police closed the cross-boundary road near the former Herders' Inn as verges caught fire. Workers from the estate which owns the moor helped fight the fire, along with tenant farmers. Smoke from the fire was visible for miles. The moors, either side of the trans-Pennine route are access areas under the Countryside and Rights of Way Act, but have been closed recently because of the exceptional fire risk. wow. nice view but where is this colne place , germany?